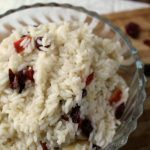 Easy side dish for your family, this rice with apples and Craisins is a recipe you will make often. So delicious! *This picture was updated 4/19/18. Caleb likes it (our youngest) and it is just as you can imagine when a 2 year old eats rice. It gets on his spoon. It gets to his mouth. The rice falls on his clothes. The small white food particle sticks like glue to his clothes. We have to hold him over the garbage can and brush it off of him. He finds that humorous. He laughs. We groan because half of the rice ends up on the floor around the garbage can and not in the garbage can. Yet we still make it and repeat the cycle. Mystery. 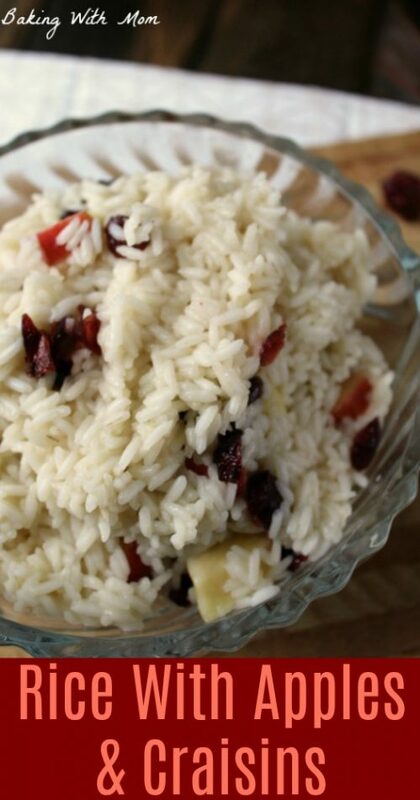 This rice with apples and Craisins dish pairs great with chicken or a roast. It also is very versatile. You could add grapes or almonds. You could try pecans or mandarin oranges. Anything to spice up that plain rice dish. So, are you like me? When it comes to main dishes like this Crockpot Roast Beef or this Mexican Casserole, there is no problem. You are the supper champ. However, when it comes to side dishes, you have the supper slump. Our side dishes consist of bread, fruit or applesauce. Or potatoes. Potatoes are always good. I do like making sides, it just doesn’t always happen. However, with this rice, it is easy to make and sooo delicious! Give it a try and let me know in the comments what your family thinks of it. Just a side note: if you want you can use 2 cups of chicken broth instead of 1 cup of water and 1 cup of broth. Both will work great! 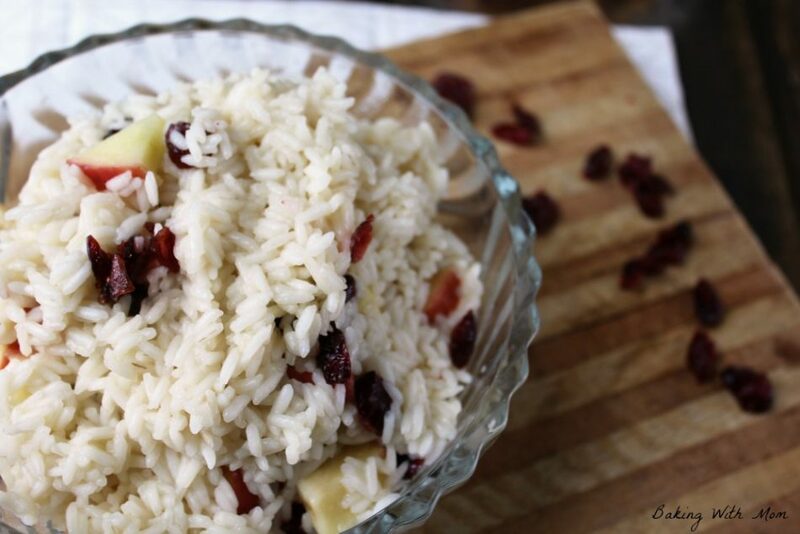 This simple side dish of rice with apples and Craisins is the perfect addition to your meal. Cook rice according to package directions, using water and chicken (or beef) broth as the liquid. 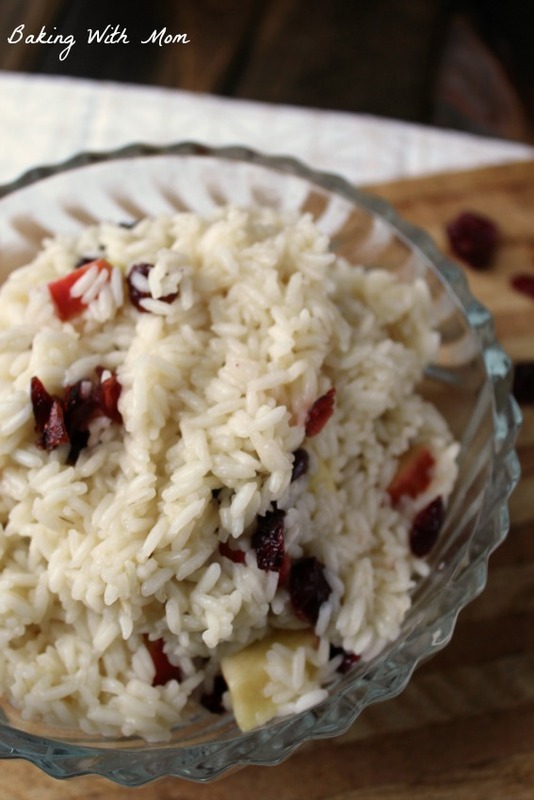 After rice is finished cooking, turn off heat and add Craisins and apple pieces. Cover pot with a lid and let sit for 5 minutes. Pin to try this later!